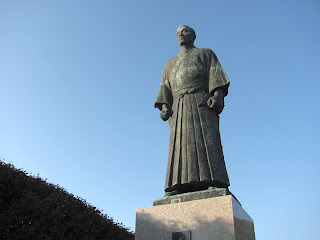 At Cape Ashizuri stands this statue of a man commonly known as John Mung (or John Manjiro). In Japanese, he is known as Nakahama Manjirō (中濱 万次郎). He was a fisherman born in a nearby community who in 1841 at the age of 14 was shipwrecked on an isolated island. He was rescued by an American whaling vessel and traveled with its crew to Honolulu and later to New Bedford, Massachusetts. He returned to Hawaii aboard another American whaling vessel, returned again to New Bedford and set out for the California Gold Rush. He returned to Japan in 1850, and in 1853 as a result of his experiences in America, was made a samurai in direct service to the Tokugawa shogunate. He was involved in the opening of Japan to the west and was part of Japan's Embassy to the United States in 1860. He later studied military science in Europe and served as a professor at Tokyo Imperial University. Quite a resume for a fisherman from a small village on Shikoku!